My new speakers in my setup. Thanks to everyone for the opinions, suggestions and comments in general. Very nice...just curious did you give the PSB's another try? Based on some of your eariler comments it sounds like you'll have to turn it up a notch or two to reach the listening levels of your digms. I have the same receiver so I know that won't be a problem... .
On the receiver at -10 put me at around 100db with a listening position 10 ft away in stereo. Lots of room left to go on the dial as it indicates around half way if you go by the digital "lined markers" and not the numbers. I've never had the need to go past 0 before with other speakers even though it can go to +16.5. I gave the PSB Image series a good audition and the Imagine series was a little too expensive. All speakers I have auditioned are pretty good. It's hard just buying one set at a time because a person would like to have more if they could. I wasn't sure how I would like the rosenut color but it fits in well. It's not as bright as pictures make it seem. I've been hearing different opinions regarding rear speakers from MA. Some say it is better to go with one of their monitor offerings rather than their surround dipoles. Eventually I will have to decide which way I want to go regarding surround/rear speakers for a 5.0 setup. Those are very nice looking speakers, Chris. 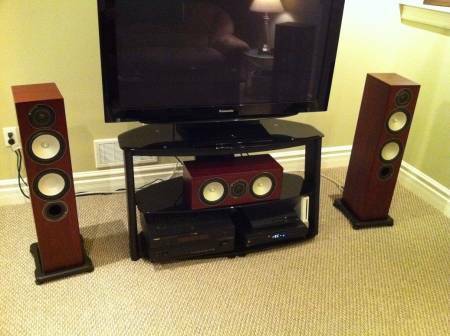 I've always enjoyed the way the Monitor Audio speakers look--very clean and elegant. You know, for rear speakers I think you can still get away with the Axiom Q series. The tonality should be close enough. Of course if you want a matching finish. . .
For a matching finish you order the Vasollo series and do a matching finish by sending in a sample, but that makes them way too expensive IMO.